I am so excited to announce that Books, Cooks, & Hooks has expanded to Etsy! This is definitely a huge undertaking and a work in progress. The majority of the items in the shop will center around books, like bookmarks, book-themed cup sleeves, cozy reading shawls, socks, and hats. Don’t worry, I still plan to post about books, but I will also post about what I’ve made in my monthly posts. I will definitely not be able to read as many books as I have in the past, but I will try to balance it out somehow while still keeping my sanity! You can find my Etsy shop link here. Right now I have about 15 listings. This will change depending on what I’m in the mood to make, what sells, and what doesn’t sell. I am always experimenting with different projects, so if you want to see something in my shop that I don’t have, just message me here or on my Etsy page, Instagram, or Twitter. So, for my monthly post, instead of books, I am going to post a few of my items I have up for sale right now. I didn’t really get a chance to read this month because I was trying to get my shop up and running, but I will definitely have some book reviews for next month’s post! 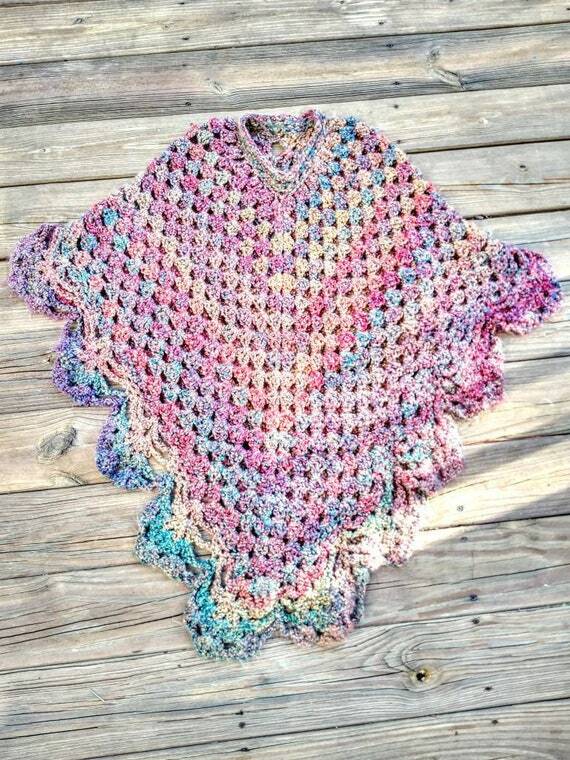 This hippie style poncho is one that I’m so proud of. I made this one for myself a couple of years ago, and I just love it. It’s great for curling up with a book and it keeps me warm during the winter months. Every time I wear it I get compliments. I use Lion Brand Homespun yarn for this, and it’s an incredibly soft, fuzzy yarn. It just envelopes your whole body and really gives you a sense of security. They have around 55 colors, many of them variegated like this one. Here is a page of their color options. Because a few of the variegated colors are sometimes hard to find, I have about 12 of the solid color options available on Etsy. If you see a color that you want that is not an option, please let me know and I can try to find it. Who doesn’t love a good cup of coffee or tea with their favorite book on a chilly morning? 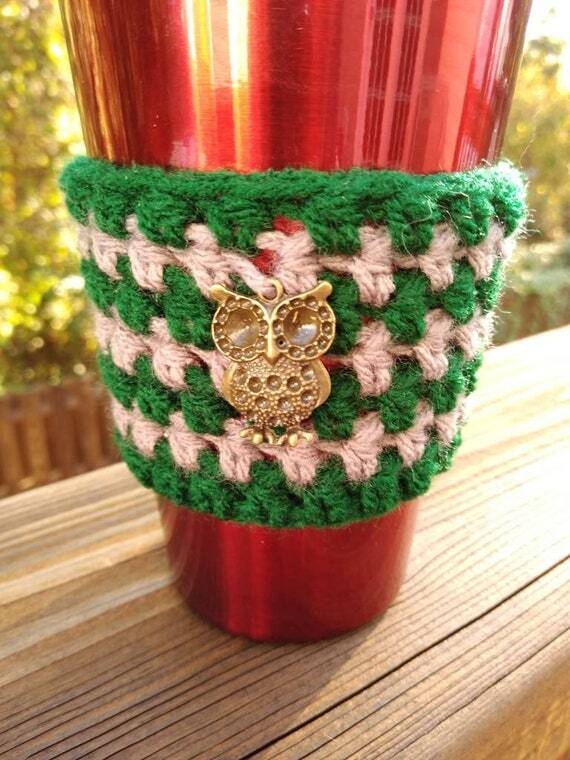 These cup sleeves are inspired by Harry Potter, and as you can see, this one features the Slytherin House colors of green and silver. I am planning on listing some from every House eventually, so stay tuned! This is just one of hundreds of bookmarks I will have available soon. Many of them have inspirational quotes under the glass dome, as well as book characters, holiday themes, and so much more. 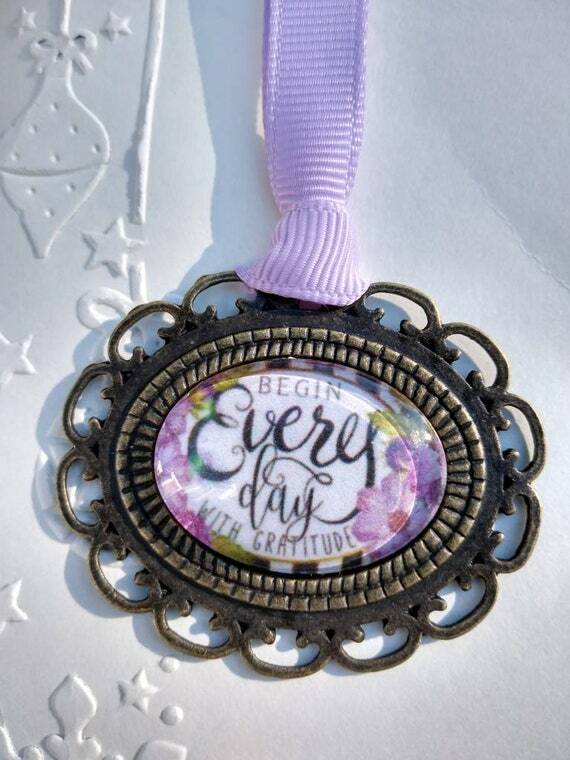 Each one comes with a ribbon attached that marks your place in your current read. Thanks so much for reading about my latest project! This definitely falls under the “Hooks” part of my blog, referring to my crochet pieces, so if you’re only interested in the “Books” or “Cooks” part, don’t worry, I will surely try to balance it all out!